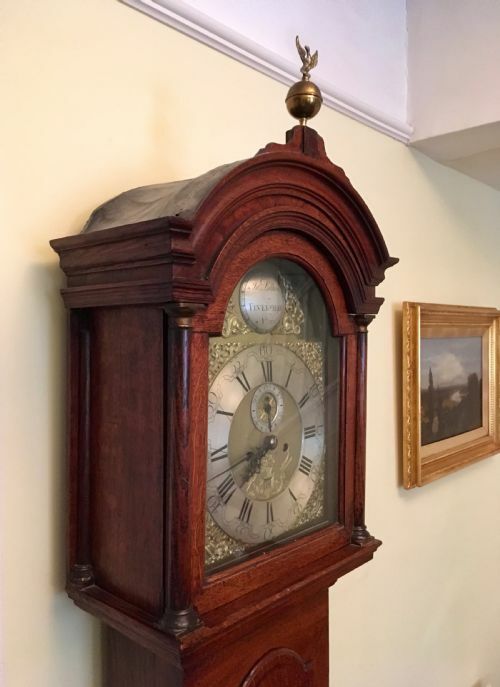 Dating to the late 18th or early 19th Century this convex glass, painted dial, single fusee mahogany drop dial clock is in excellent working condition, marked for "CM Dyas" and "Hull". 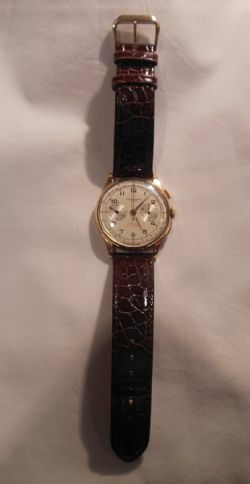 Very elegant vintage gentlemans manual wind, 17 jewel, antimagnetic, Swiss made,chronograph wrist watch in an 18ct gold case. It has just been cleaned, has a new strap and is keeping perfect time. 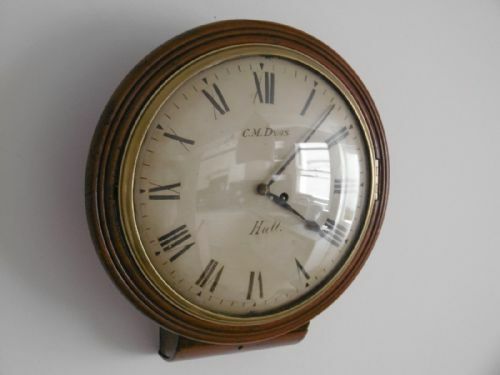 The stop watch facility is fully operational. 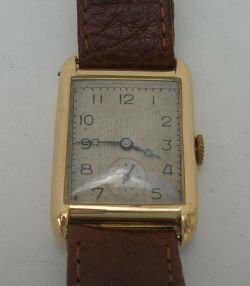 This watch dates from the mid fifties and does bear some evidence of use, as can been seen in the pictures, the glass has some scratches. 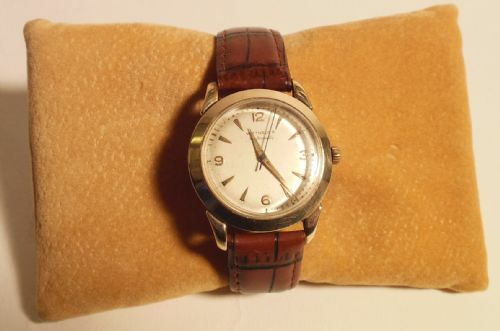 Overall the watch is in very good wearable condition. 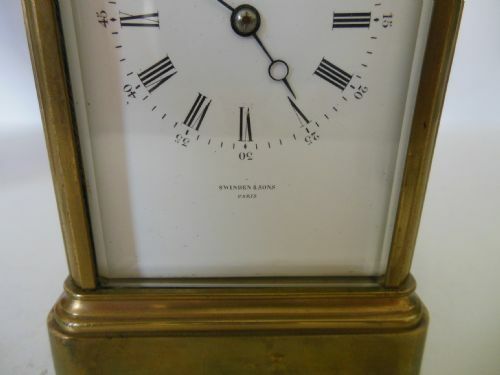 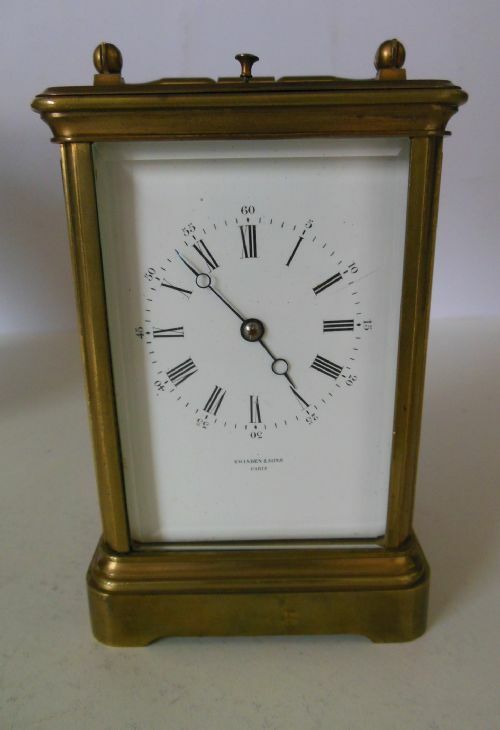 Made around the turn of the 20th Century, this French made 8 day brass carriage clock has Roman numerals, strikes on the hour and half hour, has a repeat button and an alarm. 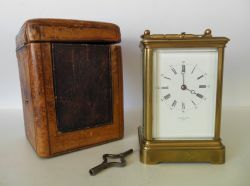 It is in excellent condition having just been cleaned and overhauled. 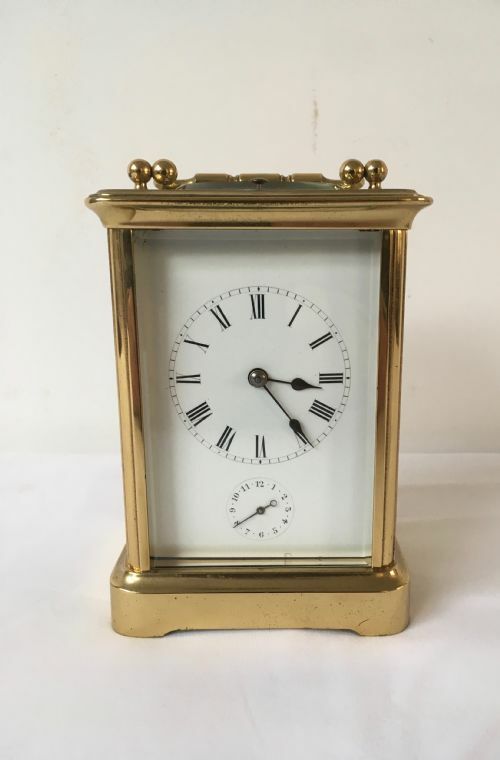 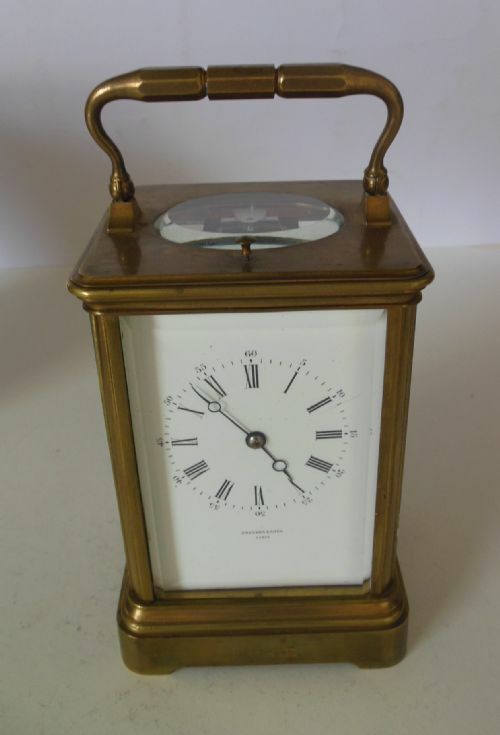 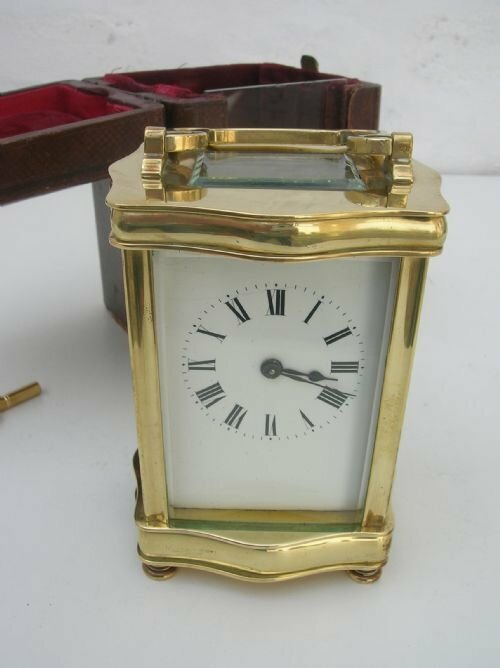 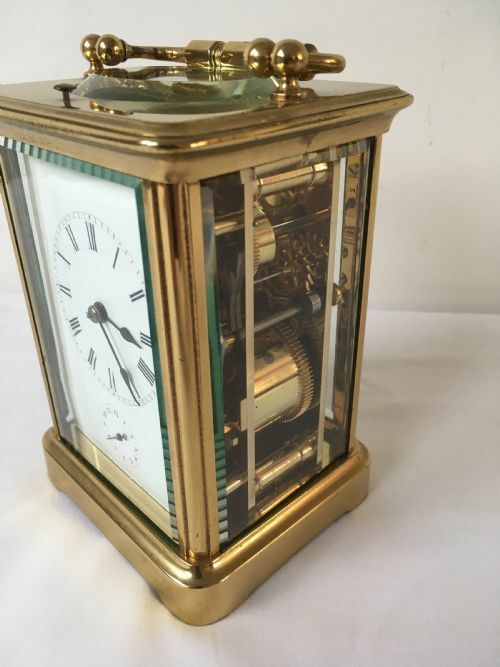 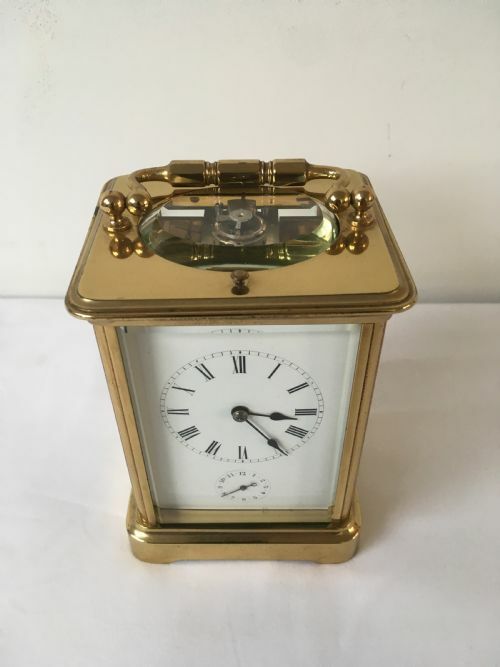 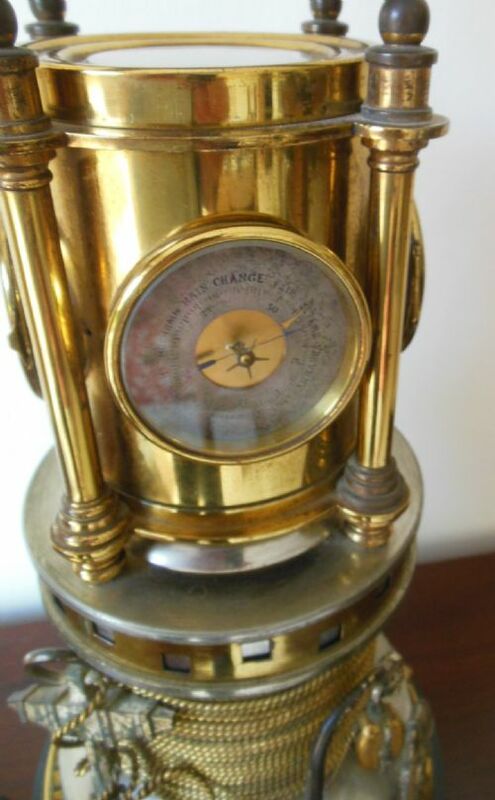 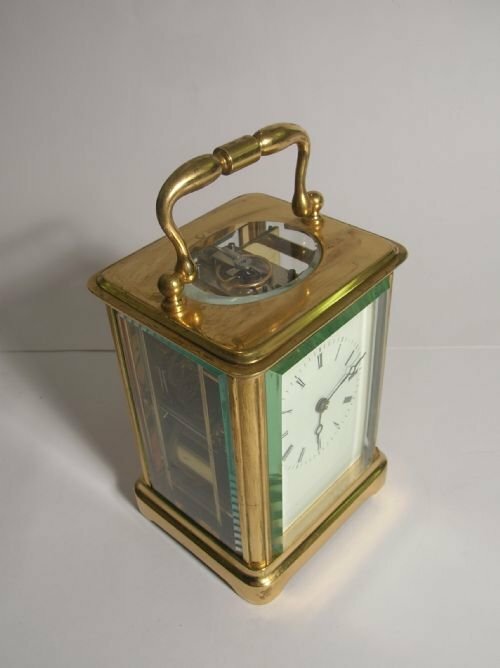 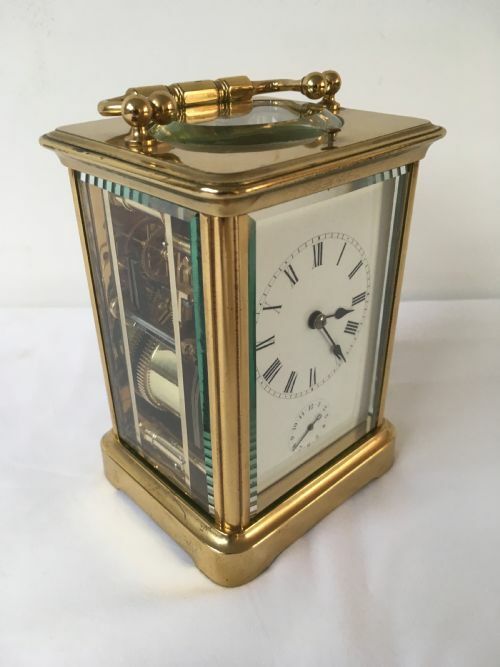 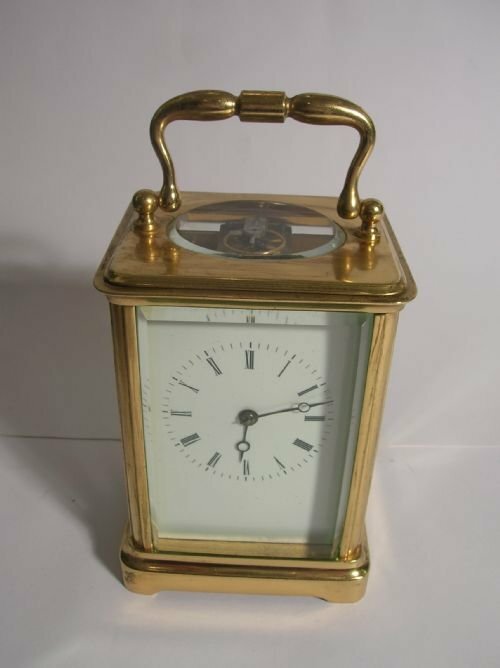 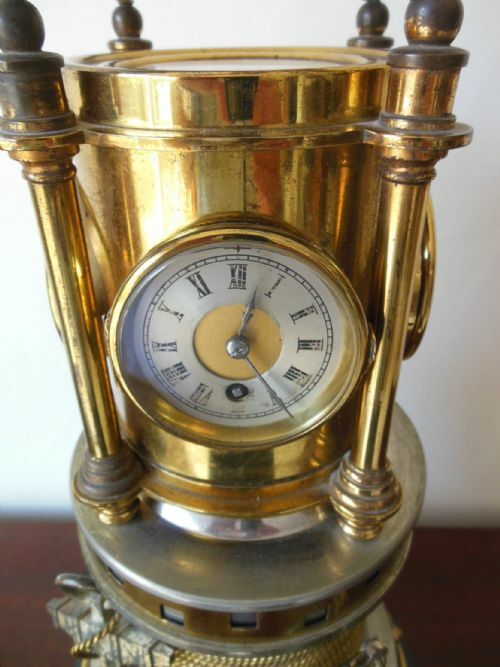 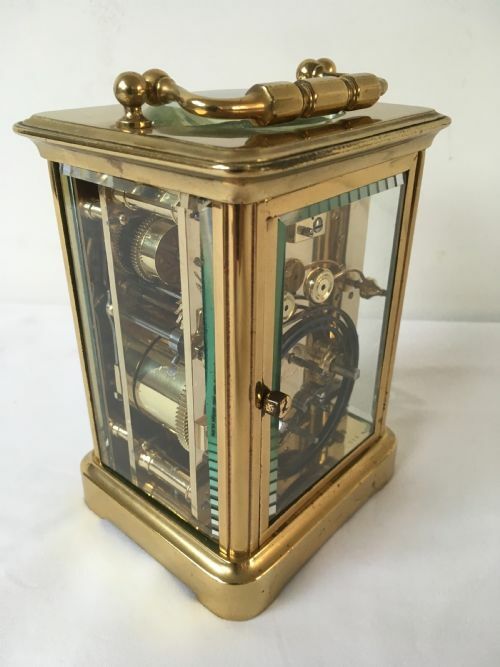 Made in France in the late 19th Century and retailed by Wales & McCulloch of Ludgate Hill, London EC, this brass, 5 glass, repeater carriage clock, striking on the hour and half hour, it is in excellent condition having just been overhauled and serviced. 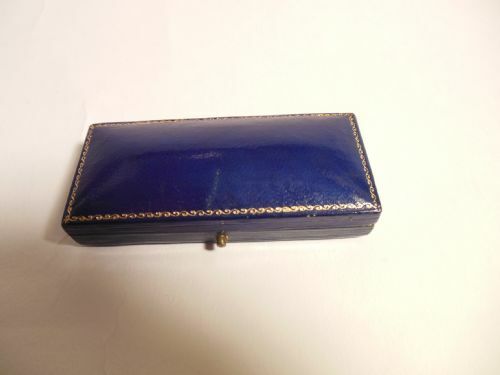 It comes with a leather carrying case and key. 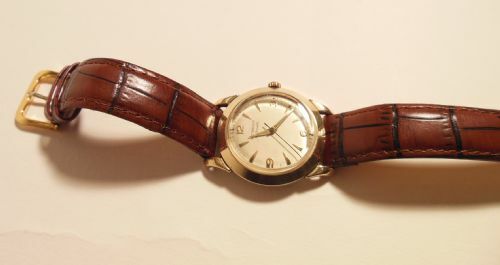 There is also twelve month guarantee. 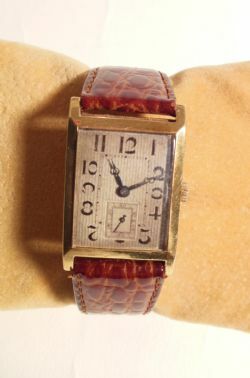 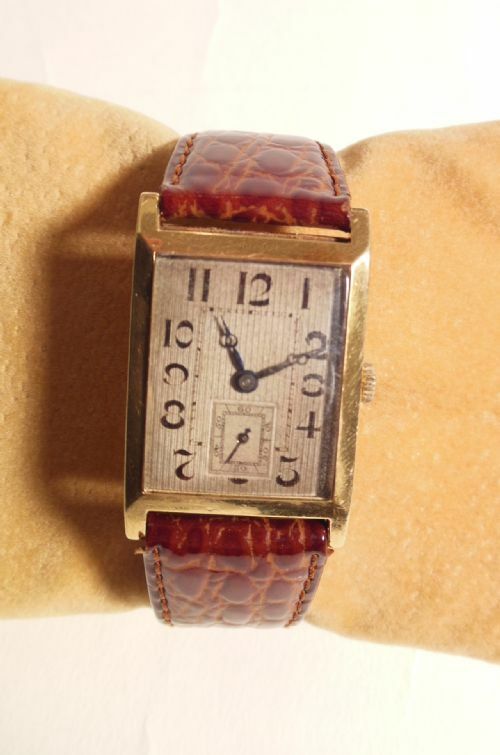 An Art Deco period gentleman's cased tank dress wrist watch hallmarked for 1927 with a silvered engine turned dial, Arabic numerals and fitted with a new Hirsch strap. 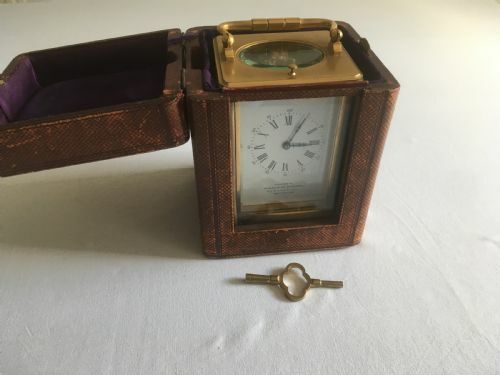 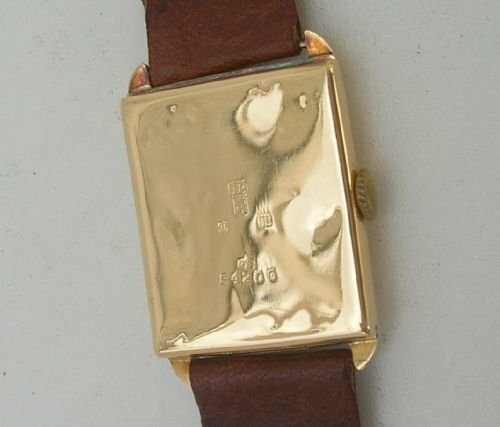 18ct gold case with Swiss made 15 jewel movement and manual wind, it is keeping accurate time and is in great original condition. 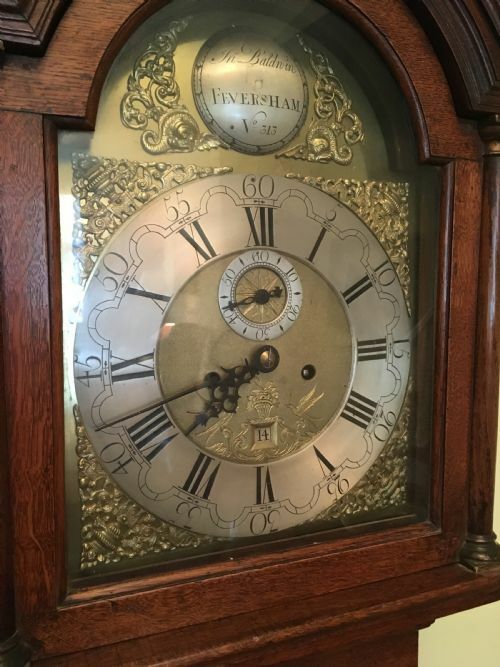 Early 18th Century Oak Long case clock made by Jonathan Baldwin 1677-1739 marked Feversham (now spelt Faversham) Kent No 313. 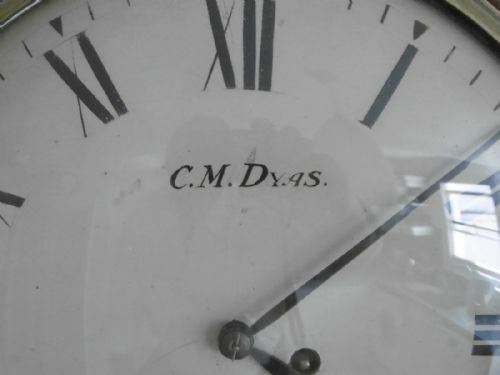 He was apprenticed to Stephen Rayner 1691-98. 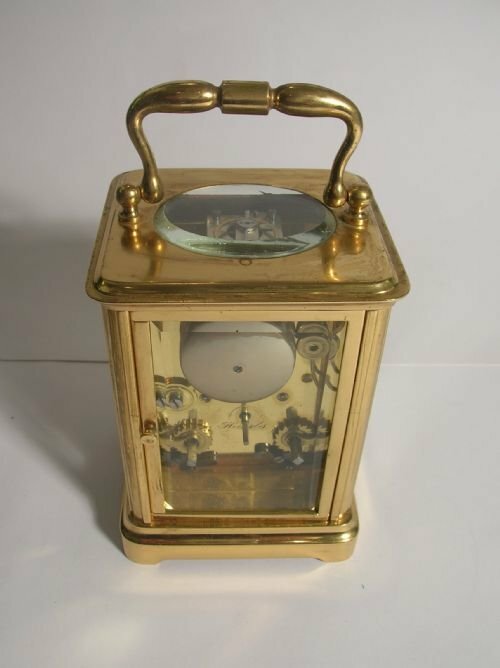 The clock has an 8 day movement with 2 weights and a pendulum striking the hours on a top bell. 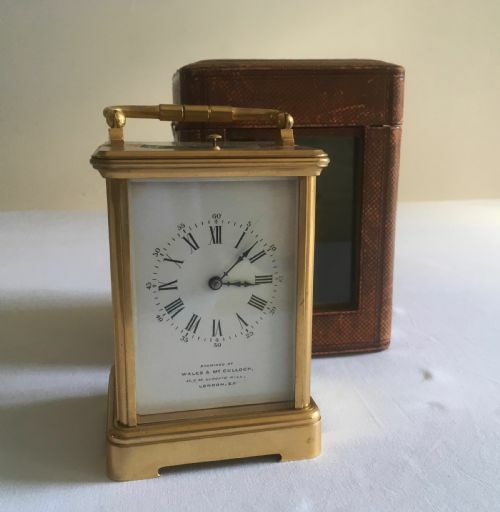 It appears to be in working order though it would probably benefit from being serviced and set up by an experienced horologist. 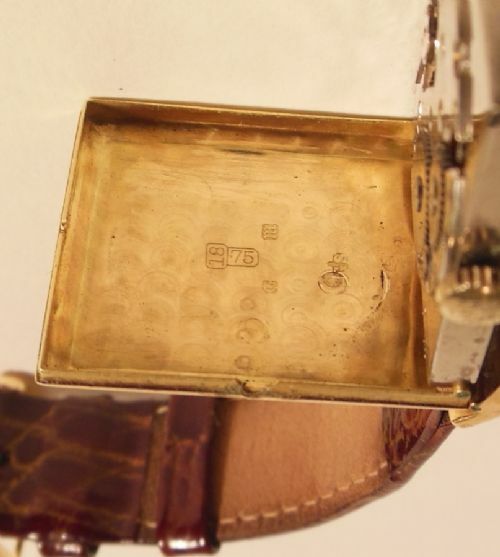 Hallmarked for Birmingham and 1911 these 18ct gold chain linked have someones initials but I have spent some time trying to decipher the letters and have failed. 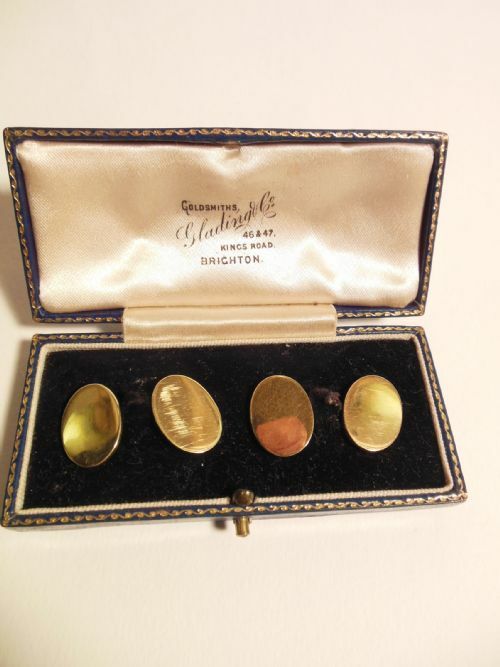 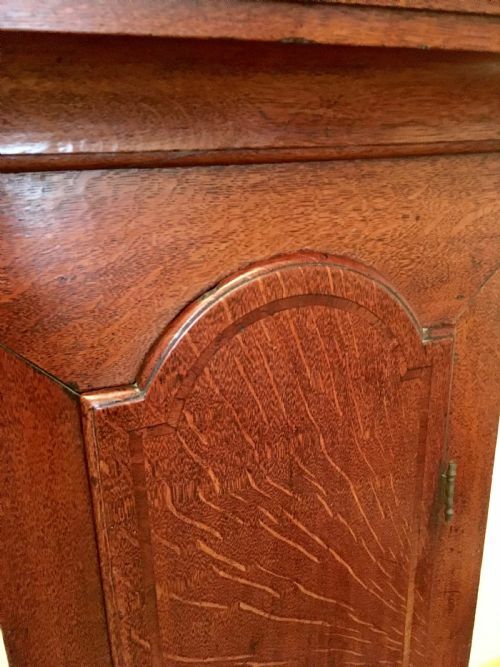 So I have decided that they are engraved with a interesting pattern and are in very good condition. 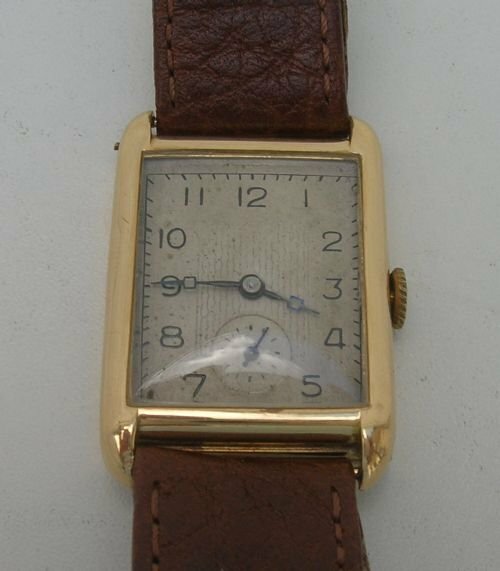 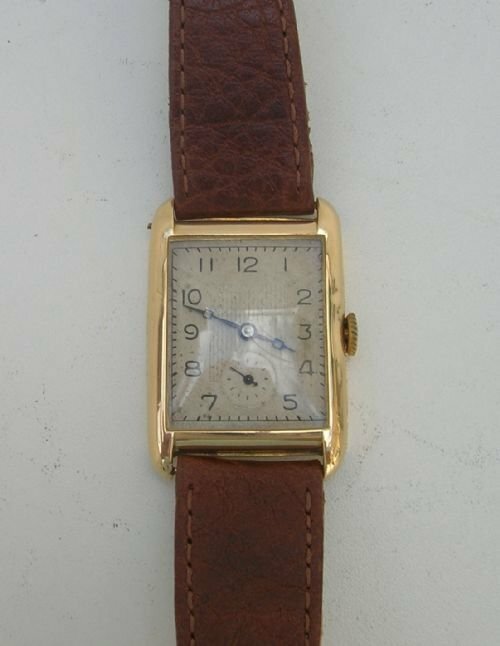 Dating from circa 1955, this elegant automatic wrist watch is in excellent working condition, it has a 17 jewel Wittnauer movement in a stainless steel body with a 10ct gold facia, Arabic numerals at the quarters with gold baton marks for the other hours and complete with a new strap. 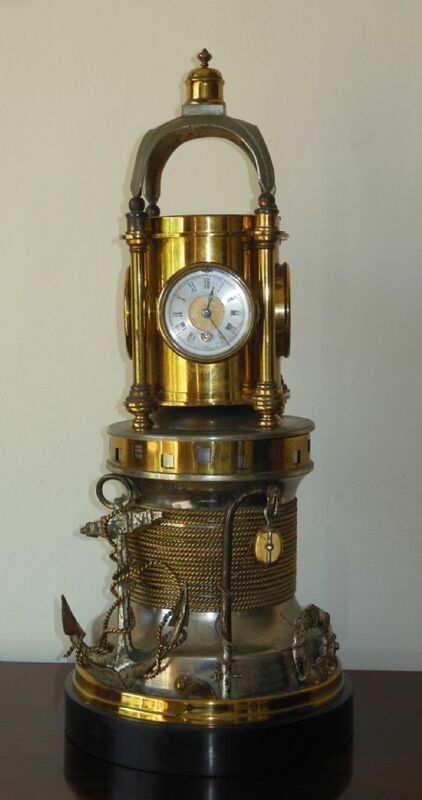 Made in France in the 1880s this is an impressive, large scale, automaton or novelty clock and dispays a nautical theme. The top half rotates on the fixed lower base and features four different faces, 2 clocks with Roman numerals are interspersed by a Thermometer and a Barometer. 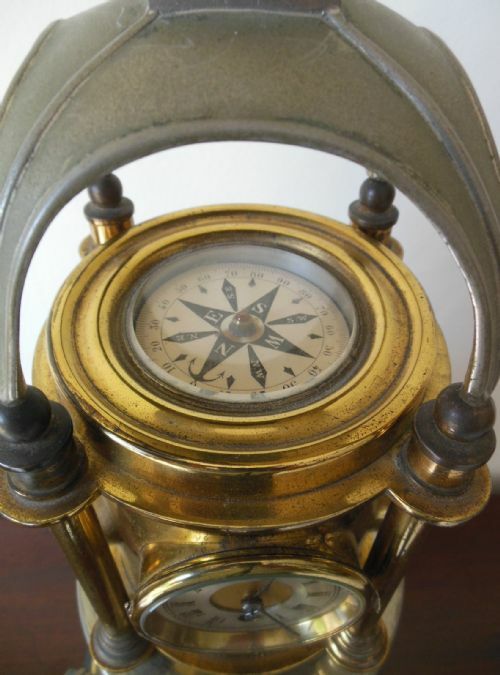 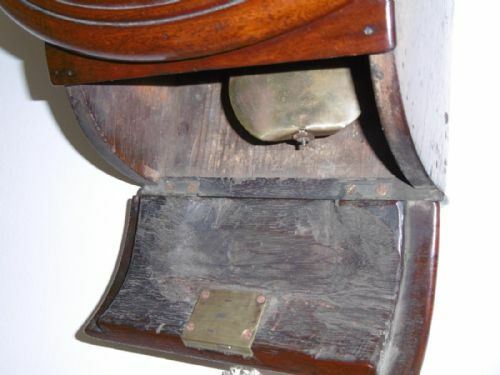 On the top of the piece covered by a white metal awning is a compass mounted in a gimbal that remains fixed pointing north as the top section rotates. 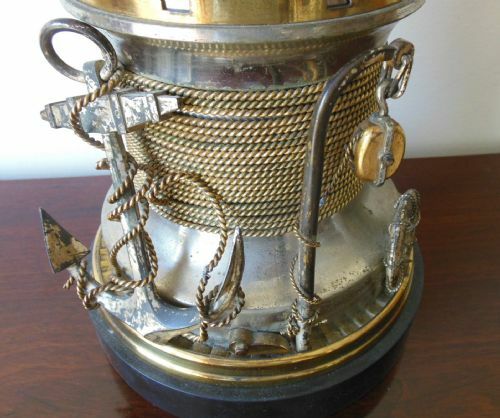 The lower section in the shape of a capstan features gilded rope coiled round the drum, an anchor, a stanchion with a pulley block and a lifebelt. 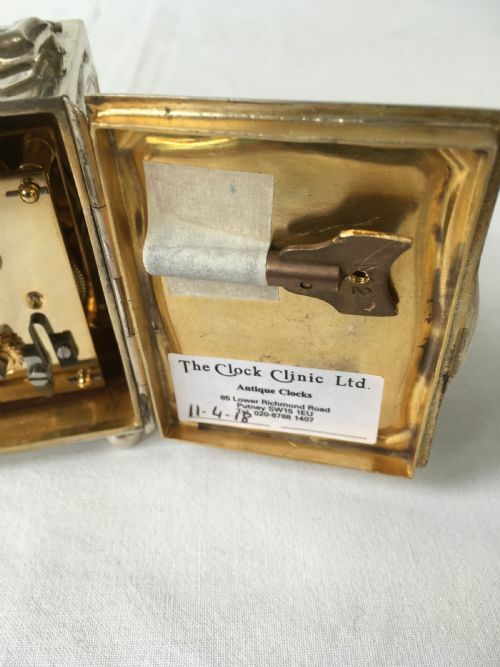 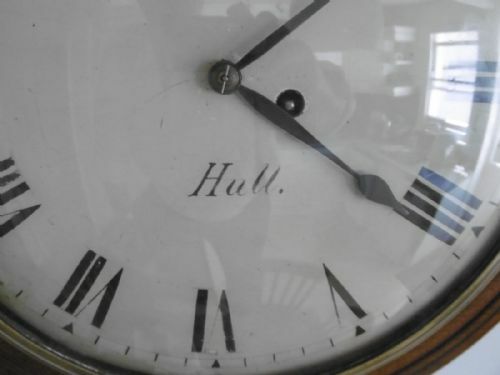 In untouched original condition, the clock has recently been serviced and the mainspring has been replaced. 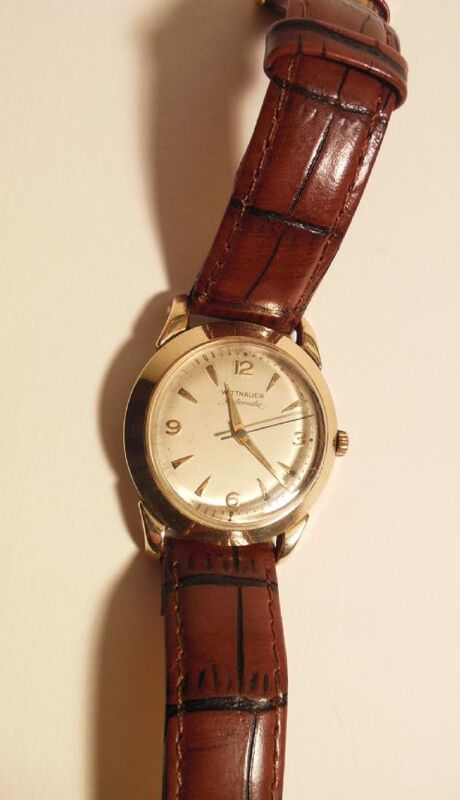 It could be restored to pristine condition if the new owner wishes but it is priced here "as is". 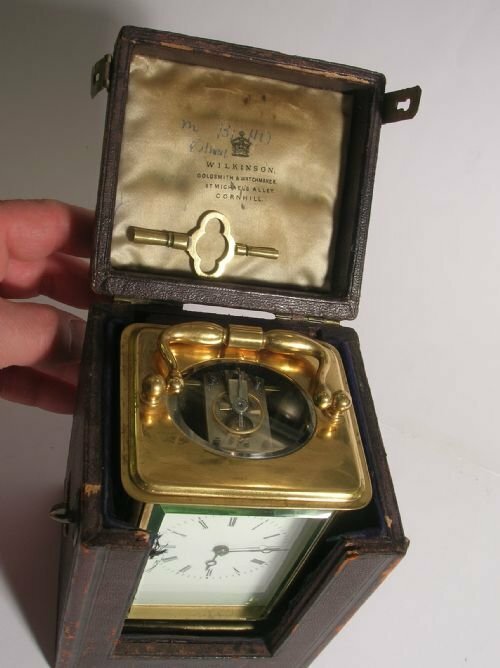 Extremely elegant manual wind Gentlemans wristwatch with a 15 Jewel Swiss movement, seperate second hand dial and an 18k gold case. 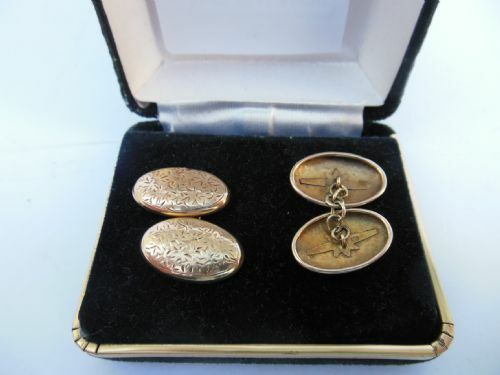 Hallmarked for London 1927 and marked for George Stockwell & Co Ltd, No 84200. 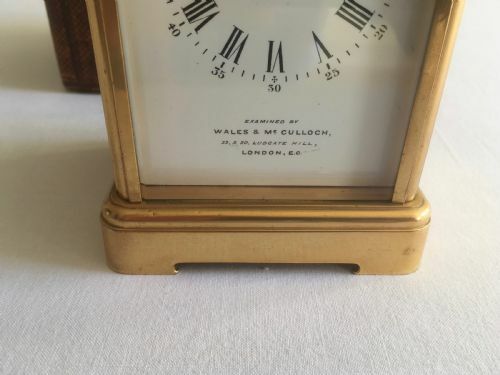 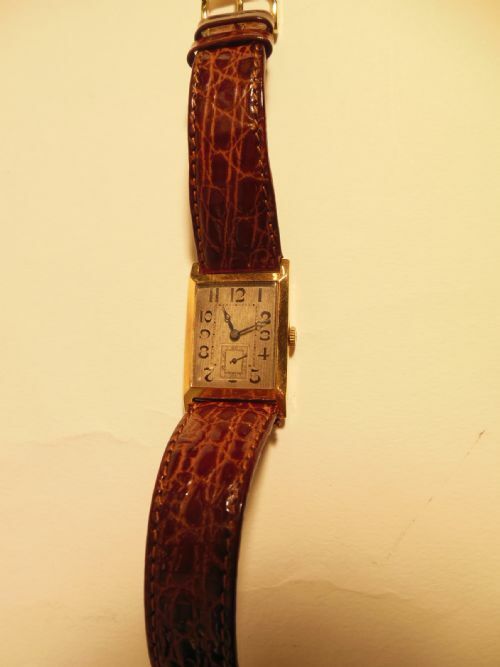 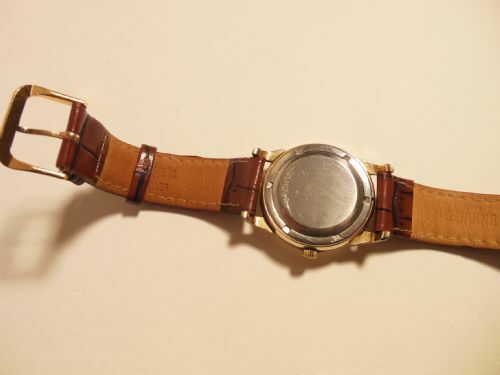 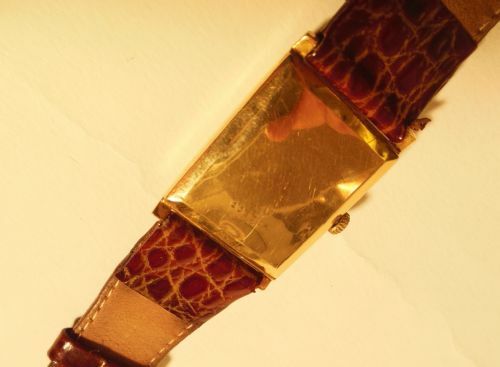 This watch has just been serviced by "The Antique Watch Company" in Clerkenwell Road, London and is keeping accurate time and has been fitted with a new leather strap. 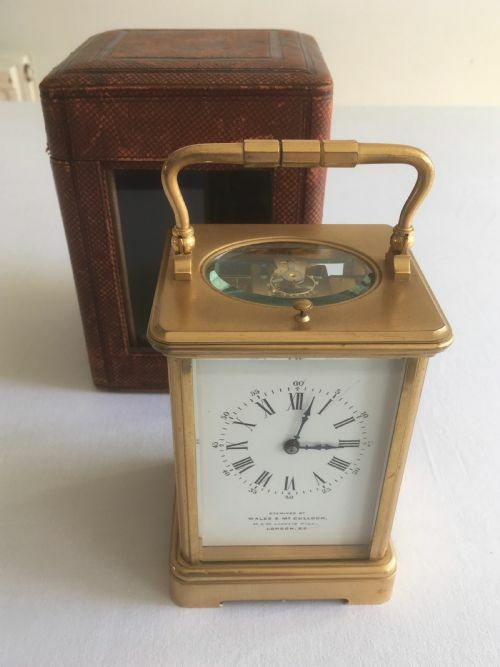 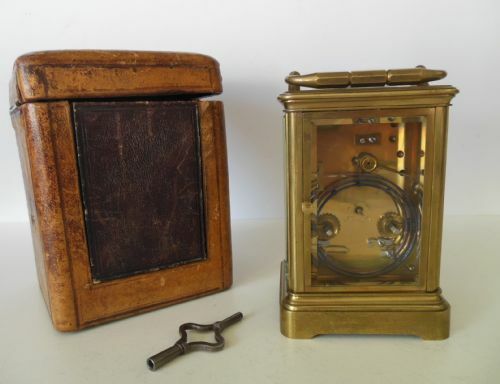 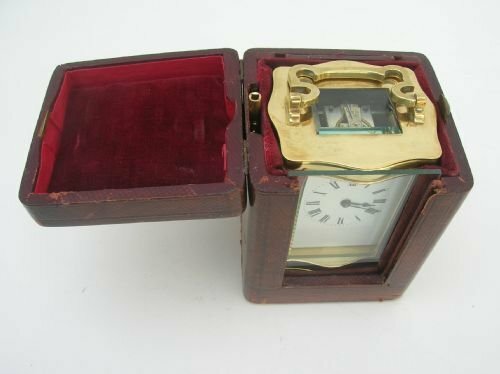 A gilt brass 8 day French carriage clock, white face with roman numerals, striking the hour and half-hour with original travelling case and winder. 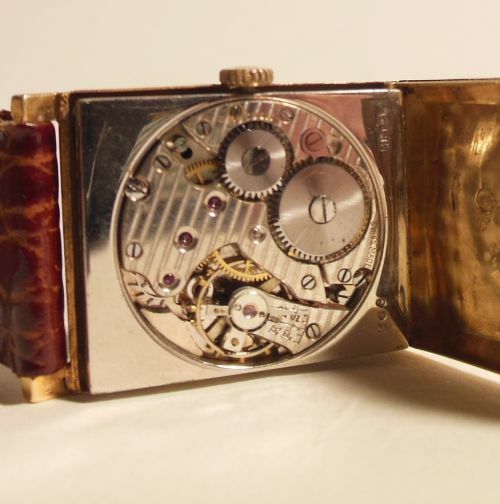 Retailed by "Wilkinson, Goldsmith & Watchmaker, St Michael's Alley, Cornhill". 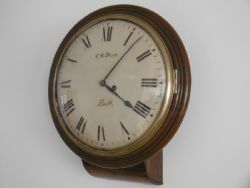 Clock has been tested, it is keeping accurate time and is in excellent condition. 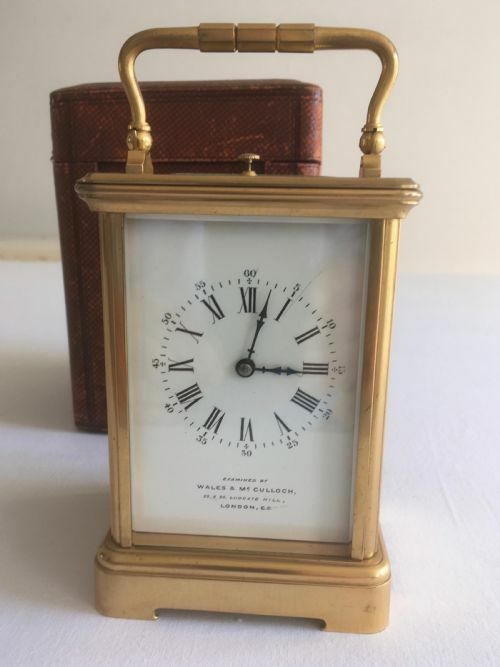 Size - Clock in case. 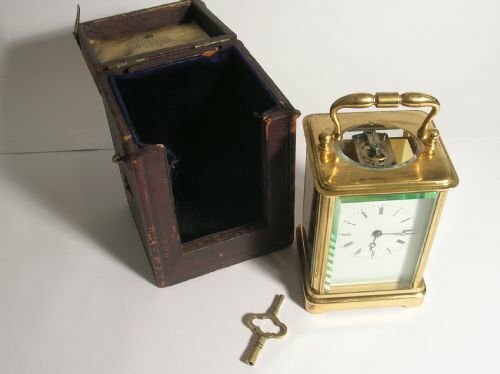 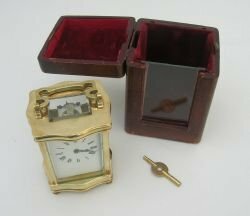 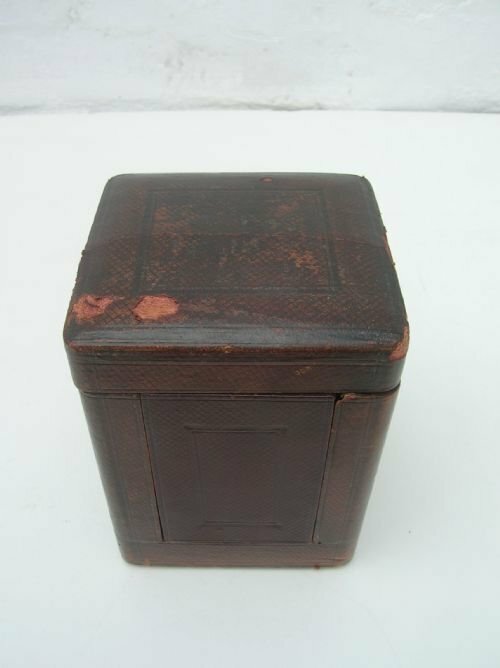 Retailed by Swindens & Sons of Birmingham in the 1880s, with blued steel hands over Roman numerals and a brass case and carrying case. This is a French made (movement by Guy Vicarino, Paris) carriage clock for the British market and is in full working order keeping accurate time, hour and half hour strike, with a repeat button. 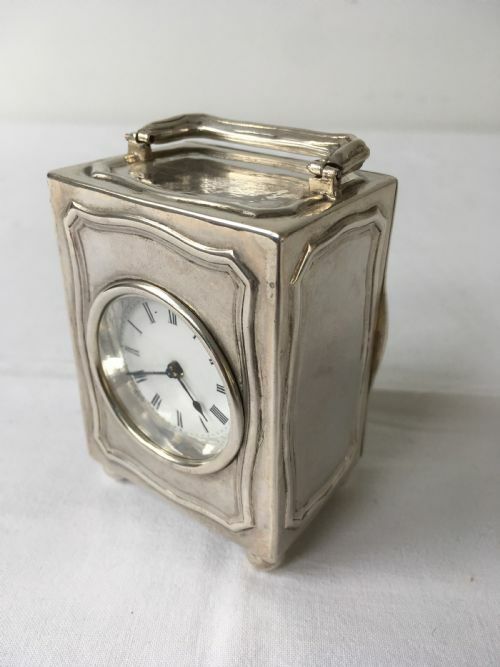 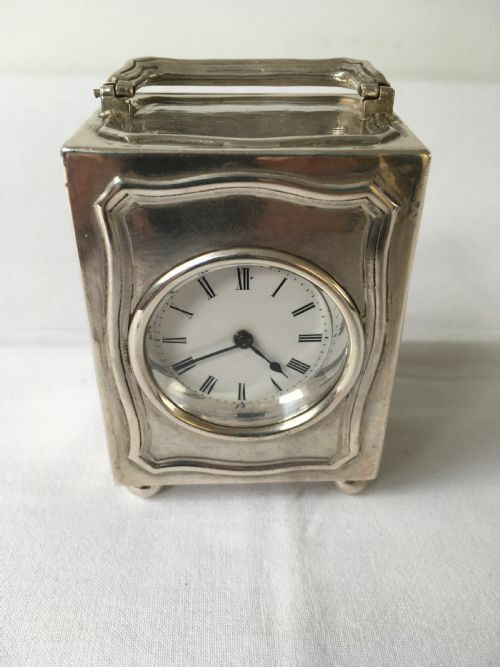 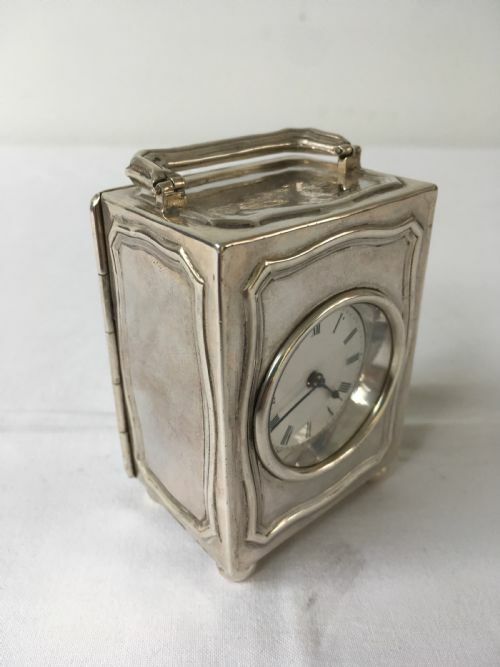 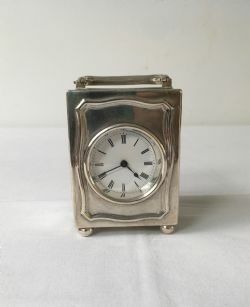 A charming continental carriage clock made in sterling silver in the early 20th century. 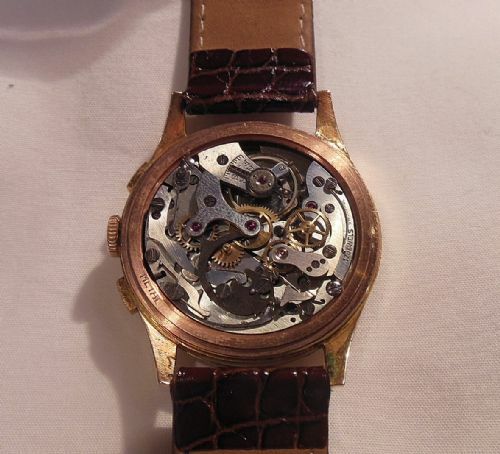 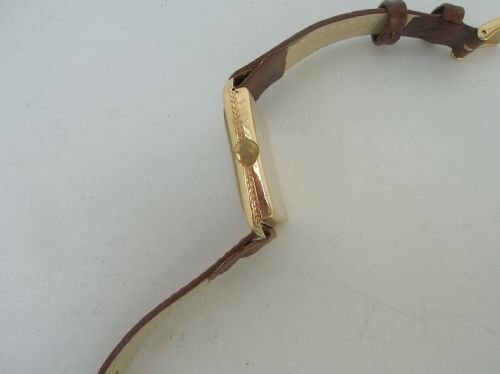 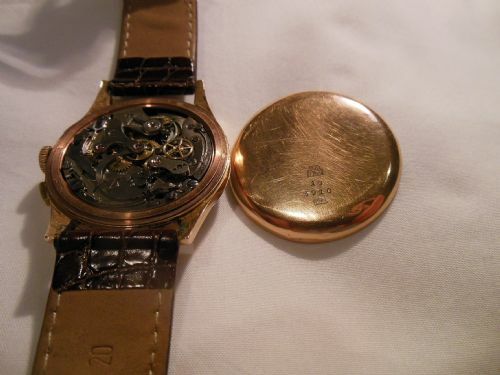 Recently serviced with clockmaker's guarantee, it is in full working order with an 8-day movement. 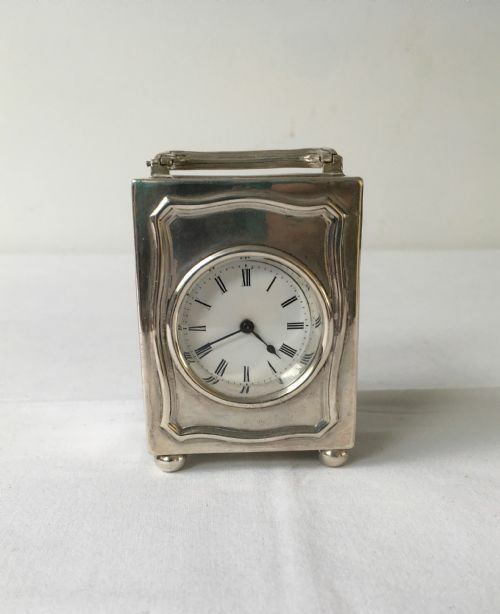 With white dial and roman numerals, the classical styled silver case has a carrying handle and small bun feet. 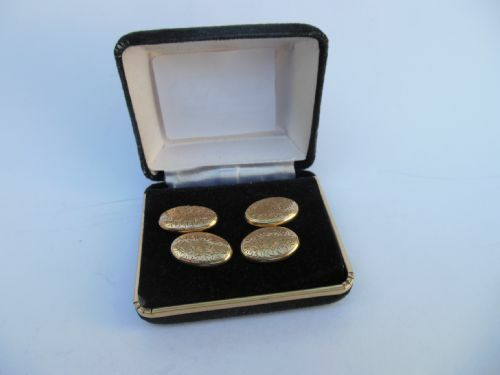 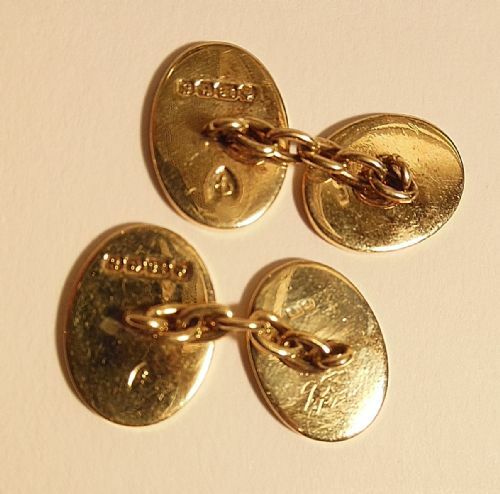 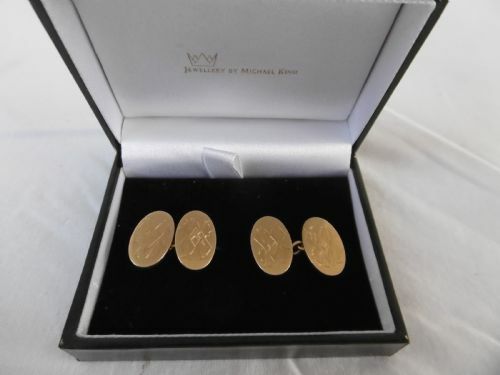 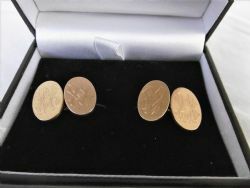 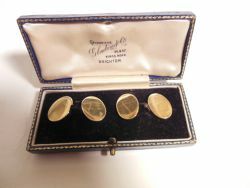 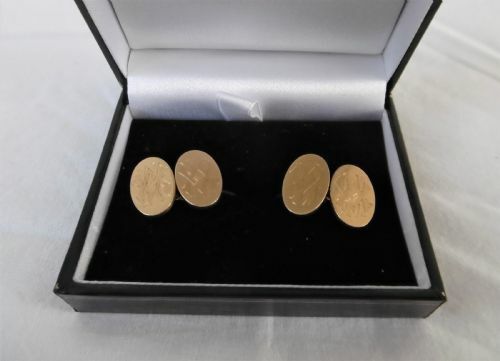 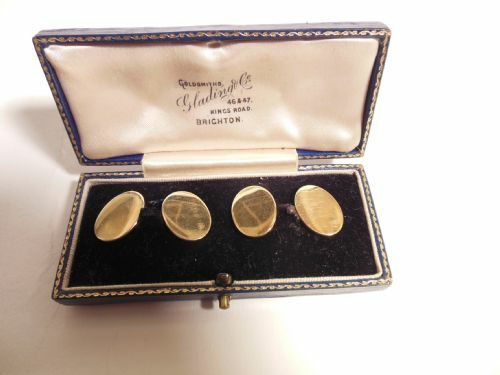 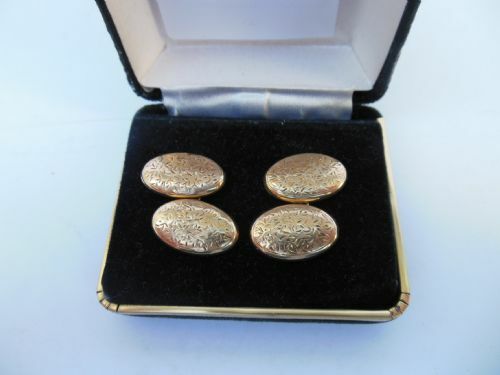 Height (with handle folded): 8.5cm / 3.3"
Hallmarked for Birmingham 1942, this pair of chain linked cufflinks are unengraved and in excellent condition. 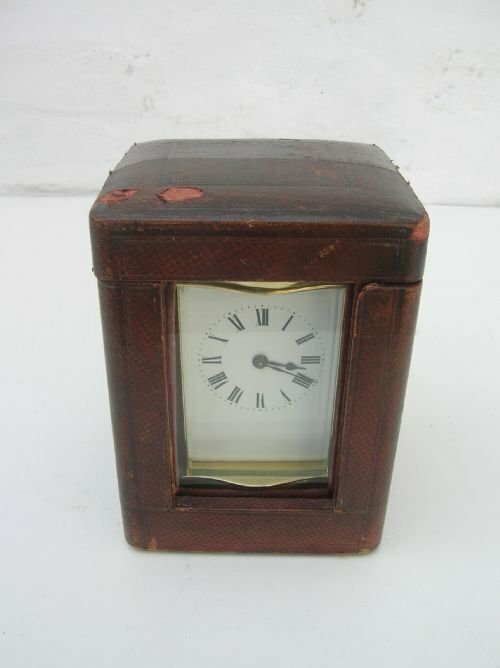 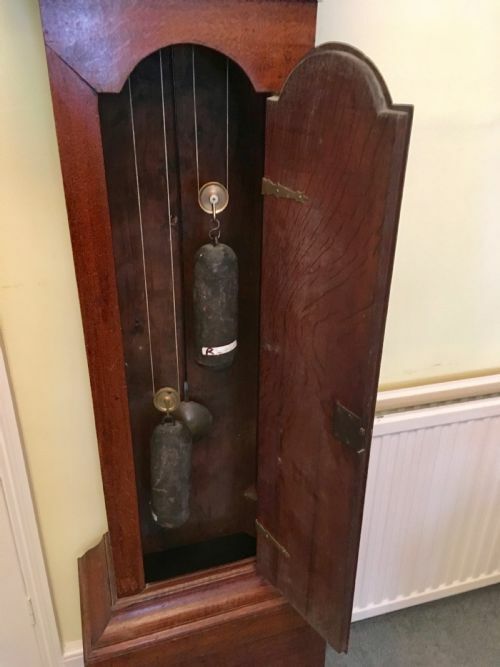 Late Victorian or early Edwardian French made 8 day carriage clock with original velvet lined case, key, glass and side panel. 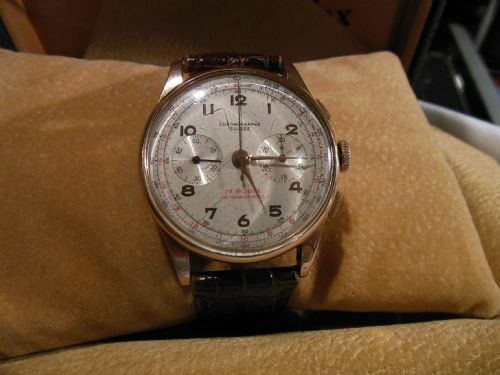 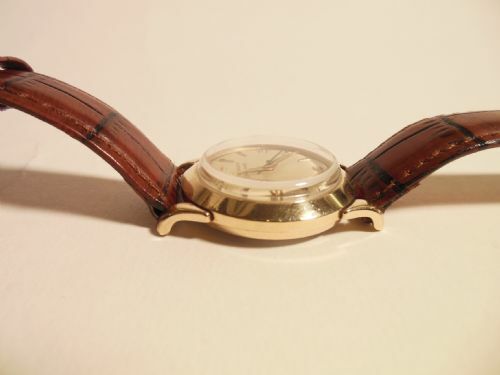 In very good condition with an elegant curved case and keeping accurate time. 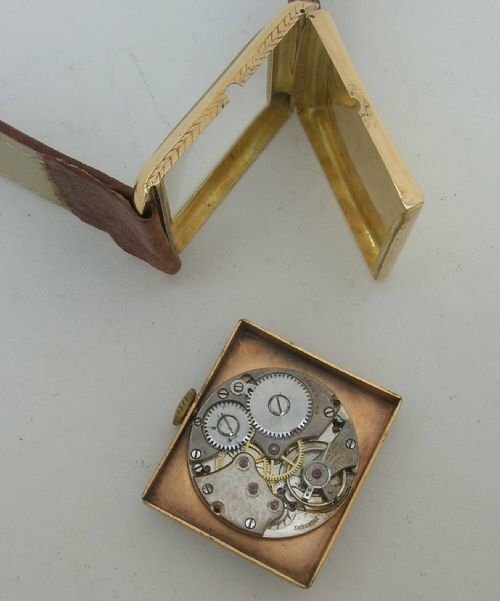 Case - 6" (15cms) x 4" (10cms) square. 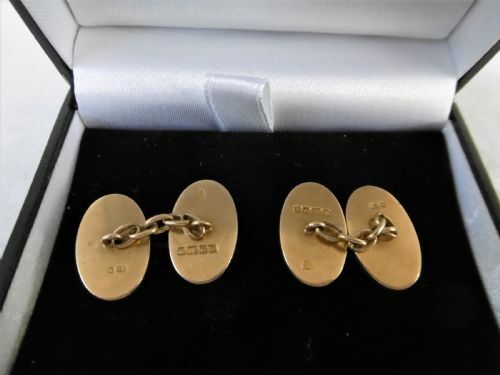 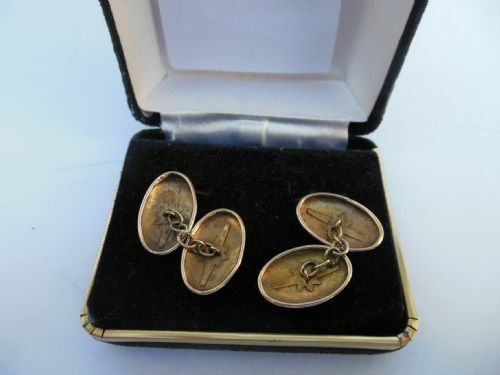 An attractive pair of Edwardian chain linked 9ct gold cufflinks.